In this special seminar, lean management thought leader James Womack explains how to manage and lead in a lean management system, the successor to obsolete “modern management” methods. Most managers and executives are futilely trying to fix their existing “modern management” systems, descended from methods introduced by Alfred Sloan in the 1920s. Why try to perfect a management approach that is fundamentally outdated and broken? 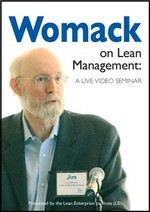 In “Womack on Lean Management,” you’ll hear management thinker, author, and LEI founder James P. Womack, Ph.D., explain why and how managers and executives must think and act in new and different ways as part of a new management method called “lean management.” In this two-hour seminar recorded live, Womack explains why lean management is the successor to modern management; how your behaviors as a manager or executive must change dramatically, and how you can thrive in this new system. The disc includes a PDF of the seminar slides.